Being a nail artist has its ups and downs. One of those things that makes me more passionate to share my craft is the appreciation and recognition that I receive from family, friends, and my readers. 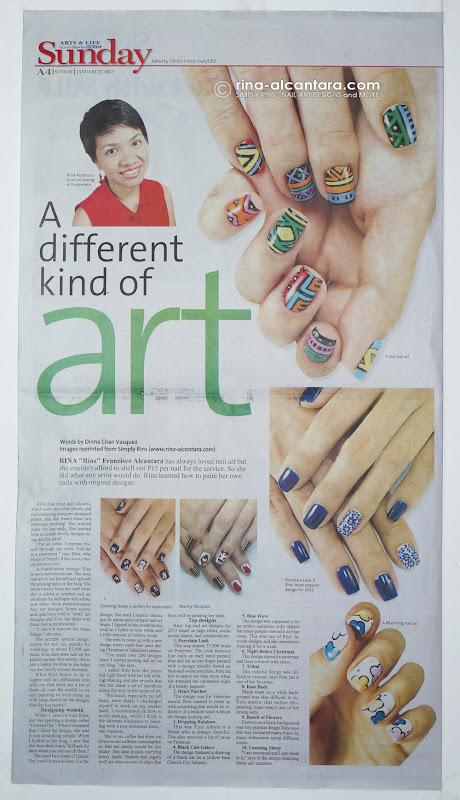 Once again, I am deeply honored to tell you that Manila Standard Today (MST) did a feature on yours truly as a nail artist. 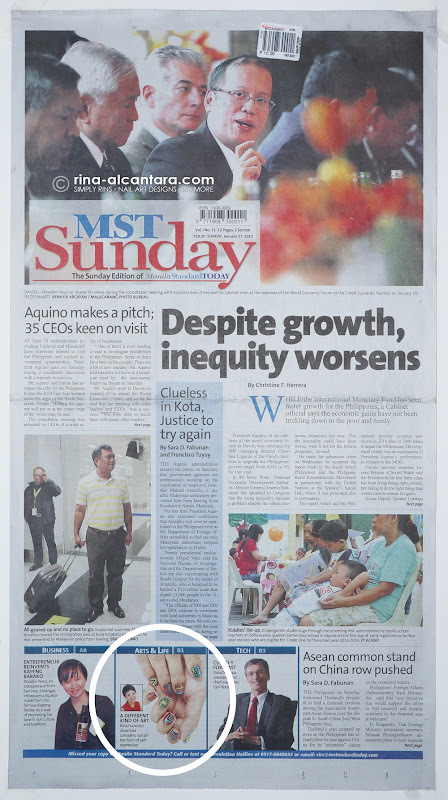 MST is a local newspaper that is distributed daily all over the Philippines. The article, entitled A Different Kind of Art, appeared today -- Sunday, 27 January 2013 -- at the Art and Life section. Look! We even made it the front page! Rina Francisco Alcantara considers nail art her form of self-expression. I was personally interviewed by Dinna Chan Vasquez, assistant lifestyle editor of MST, a few weeks back. I want to openly thank her for the well-written feature. This article nailed (!) my story as a nail artist. And my profile was rightly expressed. Dinna concluded the newspaper feature with my top 10 nail designs of 2012. I could only wish there were pictures to accompany those designs so readers would be able to relate. Rina Alcantara is an art-loving entrepreneur. If you're a fellow Pinoy and have chanced upon a newspaper stand today, may I invite you to read the article and perhaps you can share with me with your thoughts. For my international friends, and to those who can't grab a printed copy, you may read the full feature here. love it! Dinna is a friend and she's very nice and always write well :) everyone she features ended up with a big smile on their face. Wow! Congrats! You have worked hard and deserve it for sure! Keep up the great work!